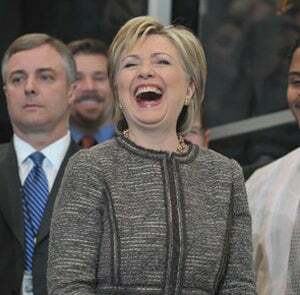 Hillary Clinton gave her first speech in her new role as Secretary of State today, addressing the thousands of State Department employees with humility, grace and a radiant smile. Video is after the jump. Between praising her staff, setting out her vision for a brighter future in American diplomacy — one that isn't led by the Defense Department — and getting in a few digs at the Bushies, she seemed thoroughly in her element and even up to the challenge. And given the (honest-sounding) cheers that greeted her, many on her staff seemed nearly as happy as she did.